This, which is Jonas De Ro's contribution to an exhibition on modern ghost towns at the Architecture Museum at Berlin's Technical University, isn't the most original in the history of post-apocalyptic eye candies, but it is definitely a refreshing contrast to the dime-a-dozen Ozymandian visions of a future Dubai in ruins. Instead of the desert, a rain forest crept in from out of nowhere. Then again, one could easily mistake this as the next grand projet planned by the ruling monarchy: a steaming jungle with artificial lagoons, ironically cooled by underground refrigerators to counter the desiccating effects of the desert sun, and populated by marvelous beasts outfitted with GPS trackers and behavioral modification devices to prevent them from escaping their prescribed habitat range and munching on people. Why contain your theme park in a mall when you can spread it out all over the city? 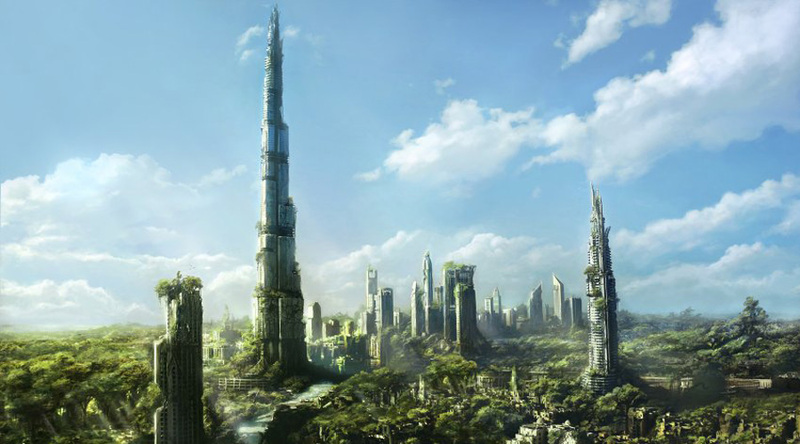 You mock Dubai's monarch's, their vision and presitance, but imagine a world without Dubai and i can assure you that you'd be posting the same rendering of an 100 year Eiffel Tower instead. Open your eyes.